When we launched NaturallyCurly 17 years ago, it was a bleak landscape for women with curls and coils. You had to search to find products designed specifically for our needs. So when we started hearing the buzz building about a Brooklyn Salon that had created a line of products especially for natural texture, we had to know more. The salon was Curve, and the products were called Miss Jessie's. Women on CurlTalk wanted to get their hands on this amazing Curly Pudding and Curly Meringue they were hearing about. I called the salon and talked to Titi Branch, one of the creators of the line. Soon we were selling it on CurlMart, and it became one of the hottest sellers. Over the years, I got to know both Titi and Miko Branch and watched as the Miss Jessie's brand became a household name for curly girls worldwide. As a fellow entrepreneur, I am thrilled at the success of the Branch sisters. Their passion and perseverance are a key reason why texture is now one of the hottest categories in haircare. 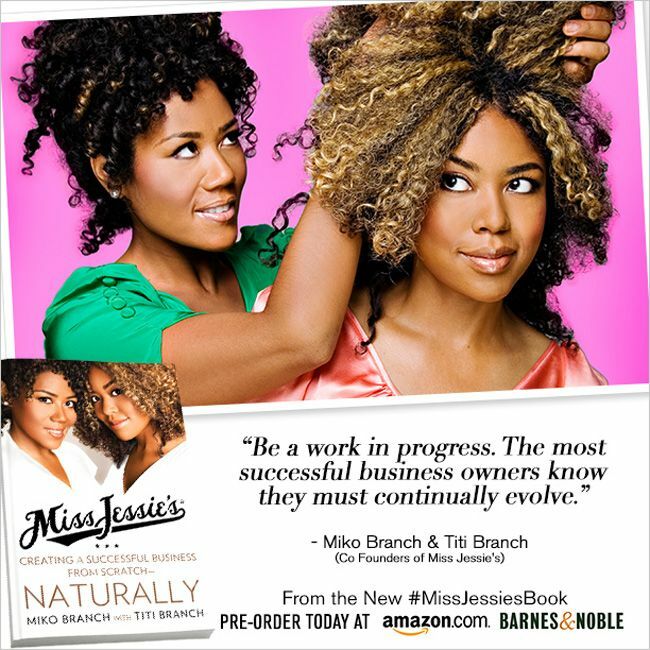 "Miss Jessie's: Creating a Successful Business from Scratch - Naturally" is part memoir, part business guide, written by Miss Jessie's' CEO Miko Branch with Titi Branch. It is a story even more poignant because of the death last year of Titi Branch, to whom the book is dedicated. When Miko and Titi were children, their grandmother, Miss Jessie, showed them the value of being “do it yourself” women, all while whipping up homemade hair concoctions at her kitchen table. As co-founders of Miss Jessie's, Miko reveals how she and Titi applied those lessons to create a successful business from scratch. "We've helped transform an industry as well as a culture, changing the way women around the globe embrace their natural hair texture," Miko writes. "This it the story of how we did it and a blueprint for how you too can become an entrepreneur and make waves in any industry you choose." Miko says "there's a message here for every individual who doesn't feel that he or she has an opportunity to be successful, whether that person is young, a single mother, working class and coming up without advantages, or an aspiring hairdresser who wants to dream big. We did it; so can you." The Branch sisters exemplify what I love most about being a part of this curl revolution - a truly grass-roots revolution started by entrepreneurs who were tired of waiting for others to create the products they needed. Through hard work, sacrifice and not taking no for an answer, they helped shape a world where women now have amazing options. It's a world I couldn't have imagined 17 years ago. And it's a lesson that transcends curly hair. We're giving away signed copies of "Miss Jessie's: Creating a Successful Business from Scratch - Naturally" to 5 lucky winners. Tell us why you want to win this book, do you have a dream of starting your own business? Let us know in the comments! This giveaway is open to U.S. residents only, as per our Terms and Conditions. *Please make sure you have liked us on Facebook, so that when we can notify you if you've won. This giveaway ends Monday, April 20.